Within a compact space, choosing the right pieces of furniture is crucial in order to feel relaxed and comfortable. Maximize every square foot of your room with Bestar's Small Space units! This set includes one 29.5-inch Storage Coffee Table and one 53.5-inch TV Stand. 29.5-inch Storage Coffee Table: 29.5 inch W x 29.5 inch D x 15.1 inch H. Durable commercial grade top surface with melamine finish that resists scratches, stains and burns. 4 open compartments to keep you organized. 53.5-inch TV Stand: 53.5 inch W x 14.5 inch D x 15.1 inch H. Durable commercial grade top surface with melamine finish that resists scratches, stains and burns. 3 open compartments to keep you organized. 1 closed compartment with 1 adjustable shelf and 2 grommets for efficient wire management. Assembly Required. 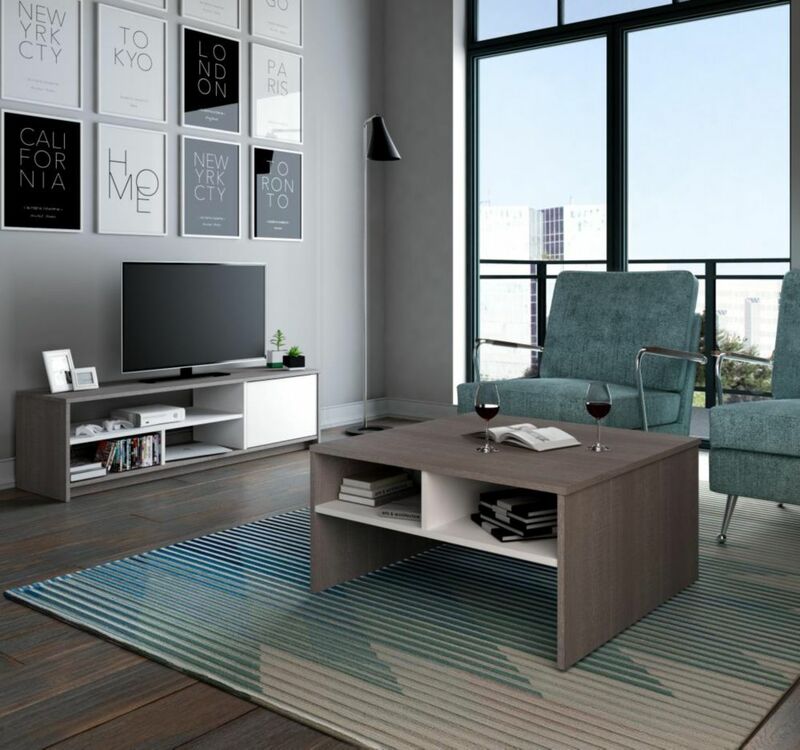 Small Space 2-Piece Storage Coffee Table and TV Stand Set - Bark Gray & White Within a compact space, choosing the right pieces of furniture is crucial in order to feel relaxed and comfortable. Maximize every square foot of your room with Bestar's Small Space units! This set includes one 29.5-inch Storage Coffee Table and one 53.5-inch TV Stand. 29.5-inch Storage Coffee Table: 29.5 inch W x 29.5 inch D x 15.1 inch H. Durable commercial grade top surface with melamine finish that resists scratches, stains and burns. 4 open compartments to keep you organized. 53.5-inch TV Stand: 53.5 inch W x 14.5 inch D x 15.1 inch H. Durable commercial grade top surface with melamine finish that resists scratches, stains and burns. 3 open compartments to keep you organized. 1 closed compartment with 1 adjustable shelf and 2 grommets for efficient wire management. Assembly Required.